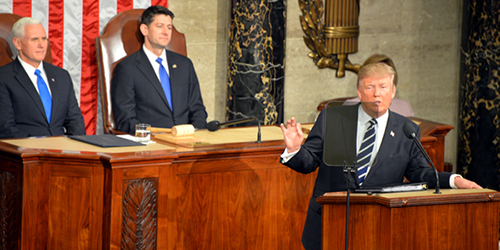 President Trump’s wide-ranging speech Tuesday in the House gallery of the U.S. Capitol drew on many of the positions he expressed during the presidential campaign, such as rebuilding America’s infrastructure, expelling undocumented immigrants and rebuilding the military. All those goals stemmed from a perception — largely deemed incorrect or exaggerated — of the failing state of America. But that’s about to change, Trump said, because last year “the earth shifted beneath our feet” with a “rebellion” that led to his election that will fundamentally change America for the better. “The chorus became an earthquake – and the people turned out by the tens of millions, and they were all united by one very simple, but crucial demand, that America must put its own citizens first because only then, can we truly make American great again,” Trump said. Perhaps in an attempt to temper opposition to his presidency, Trump drew heavily on populist rhetoric, saying the nation would move toward the principle of “Buy American, and Hire American” as he urged Congress to pass legislation that would repair and expand the nation’s infrastructure. “My administration wants to work with members in both parties to make childcare accessible and affordable, to help ensure new parents have paid family leave, to invest in women’s health, and to promote clean air and clear water, and to rebuild our military and our infrastructure,” Trump said. Trump’s words in favor of expanding infrastructure and manufacturing in the United States, such as his commitment to build future pipelines with American steel, were among the few lines during the speech that got Democratic lawmakers to rise from their seats and applaud. Notably, House Democratic Whip Steny Hoyer (D-Md.) was among those applauding the words from Trump. Despite his call to repeal Obamacare, Trump also won applause from Democrats for pledging to bring down the costs of prescription drugs. One week after his administration rescinded guidance prohibiting discrimination against transgender students in schools, Trump made no reference in his speech to LGBT rights nor did he invoke the words “religious freedom,” which is considered code for social conservatives in support of anti-LGBT discrimination. Mara Keisling, executive director of the National Center for Transgender Equality, said Trump’s words on education make no sense given the actions he’s taken in his short term in office. Although Trump didn’t explicitly denounce LGBT people or rights, he did seek to demonize other minority groups, such as undocumented immigrants, which he said have contributed to violent crime in the country. Previewing an upcoming update to his immigration ban widely viewed as discriminatory against Muslims, Trump stoked fears about terrorists coming into the United States to inflict harm on the American people. To make his point about the dangers of illegal immigration, Trump invited as among his guests Susan Oliver and Jessica Davis, whom he said were married to police officers who were “viciously gunned down by illegal immigrants with a criminal record and two deportations.” Despite opposition to Trump’s immigration policy, lawmakers on both sides of the aisle clapped when the president called for recognition of their fallen husbands’ memory. But Democrats also took advantage of inviting guests to the joint session of Congress to make a statement opposing Trump’s policy. At least five women wearing hijabs were seen in the House gallery, likely in protest of Trump’s immigration ban targeting seven Muslim-majority nations. House Minority Leader Nancy Pelosi (D-Calif.) invited as a guest Jose Antonio Vargas, a gay journalist and undocumented immigrant who had advocated to allow DREAMers and other immigrants remain in the United States. Trump also paid homage to the late U.S. Associate Justice Antonin Scalia, whom he credited with being “forever a symbol of American justice” despite his reputation for anti-LGBT rulings. The appointment to the Supreme Court of U.S. Circuit Judge Neil Gorsuch, Trump said, would be appropriate to fill the seat of Scalia. Democratic National Committee Chair Tom Perez told the Washington Blade on Capitol Hill after the speech Trump’s invocation of Scalia to describe Gorsuch is why LGBT people should take away “continued fear” from Trump’s speech. Rea Carey, executive director of the National LGBTQ Task Force, said in a statement Trump’s speech “vividly illustrates” the extent to which the president is “out of touch” with people’s lives.